The Architecture Symposium was a day of variety as 14 speakers introduced their work and ideas. Perfectly paced, the day was an excellent format to introduce practitioners from our region. The Symposium revealed some common threads – mainly the virtue of a minimal material pallet expanded by the landscape, and within this, the importance of water being integrated into projects. Waters’ sheer beauty as an experience within the built environment was shown by Young Jang and Sook See Chun from Korea. Two projects exemplified their philosophy – the Museum of War, a domestic scale structure creating intimate connections and the Red Mirror project, breathtaking in its effect through the use of material, colour, repetition and water. Both projects create the conditions for contemplation. Humbleness achieved by a restricted material pallet was also a sentiment shared by Maki Onishi and Yuki Hyakuda from Japan. They expressed in both words and examples their belief in embracing the theatre of the street and having an open studio that the community can enter, literally. The tight characteristics of high density cities like Tokyo have made these architects sensitive to making proximity playful. From their cartoon-like renderings to domestic tower-like structures with exterior circulation, examples of their work exuded delight. Kelly Shannon illustrated clearly the importance of planning infrastructure before architecture. With climate change and expanding urbanisation, master planning areas of Vietnam will reinstate the hierarchy of water over bitumen as integral to transportation and livelihoods in this region. Li Hu’s passionate cry for architecture to be generous and to give dignity is in response to the ubiquitous nature of architecture as image. He spoke fervently about the architect’s need to “get back to scale” and be inclusive. Like many of the speakers, he sees increased nature within urban spaces as essential. The importance of scale was another common thread emphasised by Richard Naish from New Zealand and Koos de Keijzer from Australia. Appropriateness of scale creates a familiarity and subsequent likability within the community. Koos de Keijzer’s specific interest is increased density in middle suburbs – without losing the “romance of the ruin” – another call for the integration of material and nature. Finally, Ada Tolle and Guiseppe Lignano’s mantra “the familiar is very strange” was beautifully emphasised by their orchestrated performance. It illustrated the poetic and functional quality of their work finding new cycles of use for familiar objects. So from small spaces to large landscapes all the speakers shared insights which gave hope. Each in their own way exemplified an enthusiasm and generosity for their vocation. Image 1: Richard Naish of RTA Studio. Photo by Raymond Cash. 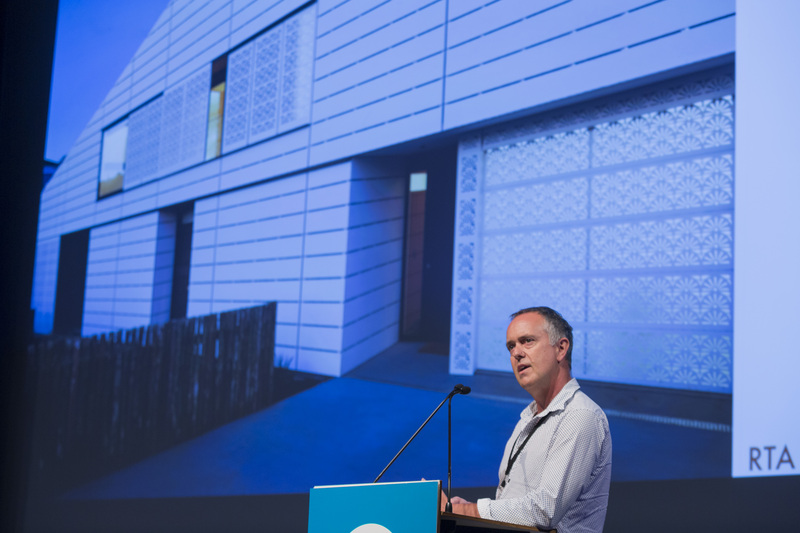 The Architecture Symposium was held on 16 March 2018 as part of the Asia Pacific Architecture Forum, an initiative of founding partners State Library of Queensland and Architecture Media. View all The Architecture Symposium videos on APDL’s Vimeo channel where you can subscribe to get the latest design presentations.